Iran on Monday promised that Hezbollah would deliver "crushing response" to the Israeli attack over the weekend, which killed six Iranian agents, including a top-level commander, and five Hezbollah members. "The experience of the past shows that the resistance current will give a crushing response to the Zionist regime's terrorist moves with revolutionary determination and in due time and place," Ali Shamkhani, the secretary of Iran's Supreme National Security Council (SNSC), was quoted as saying. The accuracy of Israel’s strike and the high-level nature of those Iranian and Hezbollah commanders killed indicates planning for a militant incursion into Israel’s northern region, according to Reuven, who said the airstrike shows a "very high level of intelligence" on Israel’s part. "If the highest level of Hezbollah commanders were in the Golan Heights and the high level of Iranians, it means that their idea, [what] they’re planning could be a kind of operation, an act against Israel on a high level," Reuven said during a conference call Monday organized by the Israel Project (TIP). "It’s significant, the high level of this meeting, of this reconnaissance of the Iranians and Hezbollah." The strike that killed these 11 militants was "very, very professional," according to Reuven, and would require "very, very high level intelligence" and "very accurate" targeting information. Multiple state-controlled Iranian news agencies confirmed that Iranian Revolutionary Guard Corps (IRGC) Brigadier General Mohammad Ali Allahdadi had been killed by "a military helicopter of the Zionist regime during a visit to the ‘Quneitra’ region of Syria." "As a result of this crime, this heroic general along with several members of Hezbollah reached martyrdom," the Iranian Students News Agency (ISNA) wrote in a Persian language report independently translated for the Washington Free Beacon by the Foundation for Defense of Democracies (FDD). Allahdadi had been sent to Syria by top Iranian commanders "so that he could combat the Zionist regime in Lebanon and Syria," according to the Iranian media. "Brigadier General Mohammad Ali Allahdadi was of the brave, devoted, and wise commanders of the Islamic Revolutionary Guard Corps whose effective contributions during the Holy Defense (the Iran-Iraq War) and after during his Commanding of the Al-Ghadir IRGC unit of Yazd province will always be enduring and inspiring to the generation of today and tomorrow of the Islamic nation," read the IRGC communiqué also issued in Farsi. The IRGC claimed that Allahdadi was in Syria to help embattled leader Bashar al-Assad combat "terrorists" there. Allahdadi also helped in "neutralizing the atrocities and conspiracies [of] this Zionist-terrorist sedition in Syria’s geography," according to the IRGC. The IRGC went on to lash out at Israel for "violating the airspace of the country of Syria" and accused the Jewish state of emboldening terrorists affiliated with the Islamic State (IS), which is battling against Assad. Israel’s actions against Iran and Syria are being "planned" along with "the cooperation [of] the heads of the White House and the occupying regime of Quds [Jerusalem]," the IRGC said in its statement. Information about the other Iranians killed remains minimal at this point. Conflicting reports have emerged about whether the top militant killed, Abu Ali Tabatabai, was officially working on behalf of Iran or Hezbollah. Tabatabai had been linked to Iran’s Al Radwan Special Operations Units, which is known to conduct combat operations, according to TIP. "His presence would have suggested, and probably indicates, operations aimed at overrunning Israeli border towns," TIP reported in an email to reporters. The Hezbollah members killed include Mohammed Issa, a senior Hezbollah figure closely tied to Iran, and Jihad Mughniyeh, Hezbollah’s leading figure in the Golan Heights area near Israel’s border with Syria. 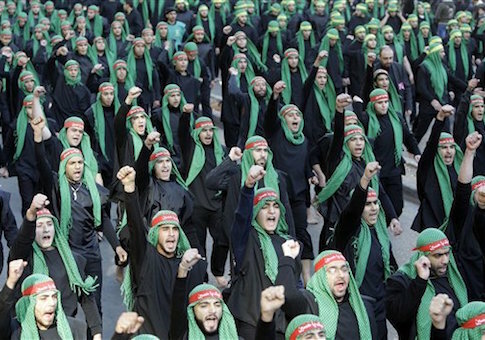 Behnam Ben Taleblu, an Iran expert and researcher for FDD, told the Free Beacon that Iran is expected to boost its presence in Syria and increase its support for Hezbollah. "Given Iran’s heightened resolve and dedication to keeping Assad in power, we can expect the Islamic Republic to continue, if not deepen its commitment to the Assad regime and Hezbollah by way of such mercenaries," he said. Taleblu also noted that Iran continues to blame the rise of IS (also known as ISIL or ISIS) on America and Israel. "The notion contained in the IRGC’s communiqué in the aftermath of the death of Commander Mohammad Ali Allahdadi, that the Islamic State (or DAESH, in Persian and Arabic) is linked to Israel and the U.S. is a common one promoted by the Islamic Republic’s hardline political elite and regime media," he explained. "Beyond narrative, this false linkage underscores an analytical shortcoming, Iran’s military and political class have failed to attribute agency to the Islamic State, be it in Syria or Iraq, and by claiming they are Western agents, misread and misdiagnosed the violent sectarian milieu that was growing in Iraq and Syria before the group’s emergence last summer," he said. This entry was posted in National Security and tagged Hezbollah, Iran, Israel. Bookmark the permalink.